Ju Mipham Rinpoche (Tib. འཇུ་མི་ཕམ་, Wyl. 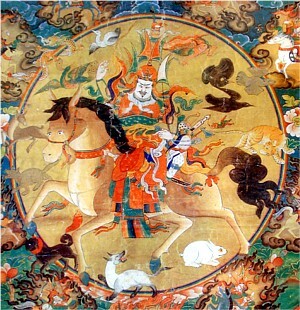 'ju mi pham) or Jamgön Mipham Gyatso (Tib. འཇམ་མགོན་མི་ཕམ་རྒྱ་མཚོ་, Wyl. 'jam mgon mi pham rgya mtsho) (1846-1912) — a great Nyingma master and writer of the last century, student of Jamgön Kongtrul, Jamyang Khyentsé Wangpo and Patrul Rinpoche. Blessed by Manjushri, he became one of the greatest scholars of his time. His collected works fill more than thirty volumes. His chief disciple was Shechen Gyaltsab Pema Namgyal. Mipham Rinpoche was born in the region of Derge in eastern Tibet. At the age of fifteen he undertook eighteen months of intensive retreat on Manjushri. He later confided to some of his students that from then on he had always been able to understand any text he read. Patrul Rinpoche taught him on the famous ninth chapter of the Bodhicharyavatara, ‘Wisdom’, and himself confirmed that after just five days’ teaching, Mipham Rinpoche had completely mastered both the words and meaning of the text. Mipham Rinpoche also received and mastered innumerable teachings and transmissions from Jamyang Khyentsé Wangpo and Jamgön Kongtrul, as well as from masters of all traditions throughout Tibet. He always took to heart Je Tsongkhapa’s famous advice that the teachings should be regarded first and foremost as practical guidance for life rather than merely as intellectual speculations. Mipham Rinpoche had an enormous impact in re-awakening a deep reverence and interest in the Nyingma and Dzogchen teachings. His contribution to the Rimé movement is inestimable. Nowadays, if you speak the truth, there is nobody to listen; if you speak lies everyone thinks it is true. I have never said this before: I am not an ordinary person; I am a bodhisattva who has taken rebirth through aspiration. The suffering experienced in this body is just the residue of karma; but from now on I will never again have to experience karmic obscuration. … Now, in this final age, the barbarians beyond the frontier are close to undermining the teaching. [So] there is no point whatsoever in my taking rebirth here…I have no reason to take birth in impure realms ever again. His principal students were the great Shechen Gyaltsap Rinpoche, and his attendant and secretary, Lama Ösel. His other close students included many of the greatest lamas of the time: Katok Situ Chökyi Gyatso; Shechen Rabjam Rinpoche; Tertön Sogyal; the third Dodrupchen, Jikmé Tenpé Nyima; the fifth Dzogchen Rinpoche; Adzom Drukpa and many others. He also blessed and gave transmissions to the young Dilgo Khyentsé Rinpoche, to whom he gave the name ‘Mangala Shri Bhuti’. Mipham was a prolific writer; three hundred and twenty-two of his Dharma works have come down to us. Apart from these, he composed more than thirty-five books on a range of subjects including medicine; poetry (particularly the Gesar epics); logic; cosmology; astrology and divination; alchemy; painting and sculpture; and engineering. For example, there is an oral tradition that at one time he designed and built a machine that flew; but soon dismantled it again, saying that such things were just distractions. The majority of volumes of Mipham Rinpoche's collected works (gsung 'bum) as Tibetan ebooks can be downloaded here. Künzang Chödrak, Mipam’s Essential Hagiography and Catalogue of Works (གངས་རིའི་ཁྲོད་ཀྱི་སྨྲ་བའི་སེང་གེ་གཅིག་པུ་འཇམ་མགོན་མི་ཕམ་རྒྱ་མཚོའི་རྣམ་ཐར་སྙིང་པོ་བསྡུས་པ་དང་གསུང་རབ་ཀྱི་དཀར་ཆག་སྔ་འགྱུར་བསྟན་པའི་མཛེས་རྒྱན་, Wyl. gangs ri’i khrod kyi smra ba’i seng ge gcig po ’jam dgon mi pham rgya mtsho’i rnam thar snying po bsdus pa dang gsung rab kyi dkar chag snga ’gyur bstan pa’i mdzes rgyan), in Mipam’s Collected Works, vol. 8 (hung), pages 621–732. Duckworth, Douglas S. Mipam on Buddha-Nature: The Ground of the Nyingma Tradition, State University of New York Press, 2008. Goodman, Steven. Mi-pham rgya mtsho: An Account of His life, the Printing of His Works, and the Structure of His Treatise entitled mKhas pa'i tshul la 'jug pa'i sgo, Windhorse I, 1981. Pettit, John W. Mipham's Beacon of Certainty: Illuminating the View of Dzogchen, the Great Perfection Studies in Indian and Tibetan Buddhism, Wisdom Publications, 1999, Chapter 2, 'The Life and Works of Mipham Rinpoche'. Phuntso, Karma. '‘Ju Mi pham rNam rgyal rGya mtsho: His Position in the Tibetan Religious Hierarchy and a Synpotic Survey of His Contributions' in Ramon N. Prats ed. The Pandita and the Siddha: Tibetan Studies in Honour of E. Gene Smith, New Delhi: Amnye Machen, 2007. Nyoshul Khenpo, A Marvelous Garland of Rare Gems: Biographies of Masters of Awareness in the Dzogchen Lineage, trans. Richard Barron (Junction City: Padma Publishing, 2005), pages 415–425. Smith, E. Gene. 'Mi Pham and the Philosophical Controversies of the Nineteenth Century', in Among Tibetan Texts, Wisdom, 2001. This page was last edited on 30 November 2017, at 15:10.